For the 2011-2012 renovation of the Bernard Family Hall of North American Mammals dioramas, we were limited by the need for high lightfastness (resistance to fading), in situ treatment considerations, health and safety requirements, and reversibility/retreatability, so the project conservators looked to materials already in use in our profession (see previous posts for more details on this project). The Orasol® dyes seemed like a good alternative to the acrylic paint favored by the project taxidermist. Orasol® dyes (Ciba-Geigy; currently marketed by BASF for coatings and printing inks) are commercially available metal complex dyes that cannot be dissolved in water, but can be dissolved in many common organic solvents such as ethanol. They can be applied without salts or peroxides (which can be acidic), and require no rinsing, making them useful for in situ treatment. They are manufactured in a palette of 26 colors, which was enough to mix the range of tones needed for the North American Mammals. They are also generally approved by the conservation community and are commonly used in furniture and wood stains, as well as for tinting epoxy and other resins used for fills. A dye is a substance that has an affinity to the substrate (in our case, the hair of the taxidermy mount) to which it is applied. In contrast, a pigment is generally insoluble and has no affinity for the substrate. 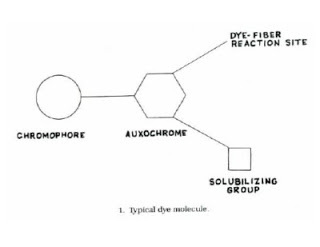 Auxochrome – influences the intensity of the color and provides the site at which the dye chemically bonds with the fiber (hydrogen, ionic, or dipole-dipole interactions with the substrate). Solubilizing group – allows the dye molecule to be soluble in a given solvent so it is capable of reacting with the fiber. Metal complex dyes are made of a transition metal ion such as chromium, copper, or cobalt complexed to two symmetrical dye molecules (chromophore and auxochrome). In general, members of this group have better lightfastness (resistance to fading) compared to other dyes due to the stability of the chelated complex and their large particle size; this, along with their working properties, has been the basis for their past use in conservation. To determine if the dyes met all of our needs for the project, we developed some tests to compare the acrylic paints to the Orasol® dyes. The conservators worked closely with the taxidermist and partnered with outside conservation scientists to test the materials against these necessary criteria: minimal physical alteration to the hairs, retreatability/reversibility, and high lightfastness. The physical appearance of bison hair samples colored with acrylic paint and ones colored using Orasol® dyes was examined using normal light as well as scanning electron microscopy (SEM). At first look, all of the colored samples appeared somewhat similar. The acrylic paints produced a matted and stiff feel, whereas the Orasol® dyes produced a more natural look and feel. The SEM images showed us that the binder in the acrylic paints covered the hair cuticle unevenly, creating a non-cohesive coating around the hair with some visible peeling and lifting. The Orasol® dyes were only just visible on the hair fibers and did not appear to cover or coat the hair shaft. The surface of bison hairs imaged using scanning electron microscopy. From left to right: control (no colorant), acrylic paint, Orasol dye. The taxidermist also found that the Orasol® dyes could be reduced or removed entirely when wiped or rinsed with ethanol after application. Although initially taken aback by this revelation, we quickly recognized the potential for reversibility, as well as the ability to produce special effects, such as localized reduction or removal of color to achieve special effects. 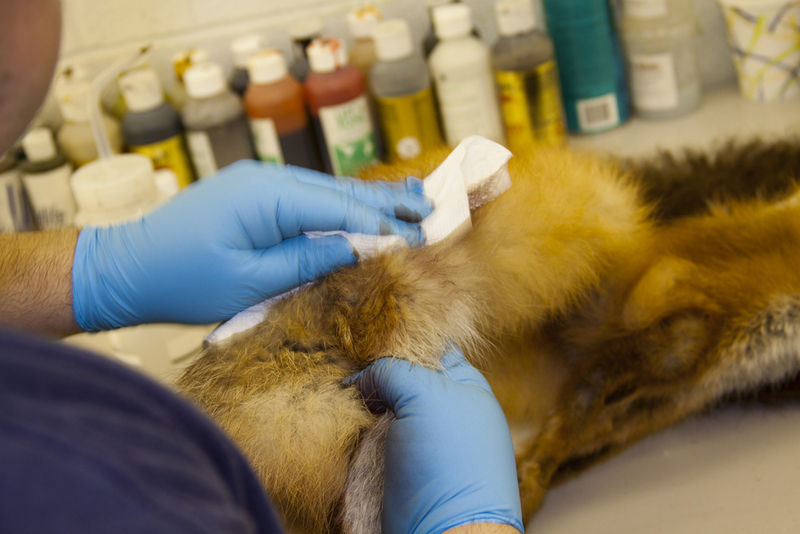 Project taxidermist George Dante reduces dye from a practice skin. Metal complex dyes are generally regarded as having a high lightfastness. However, chromophore and auxochrome structures vary, making some dye colors more susceptible to fading. In their product literature, the manufacturer reports a definite range in both lightfastness and solubility from color to color. 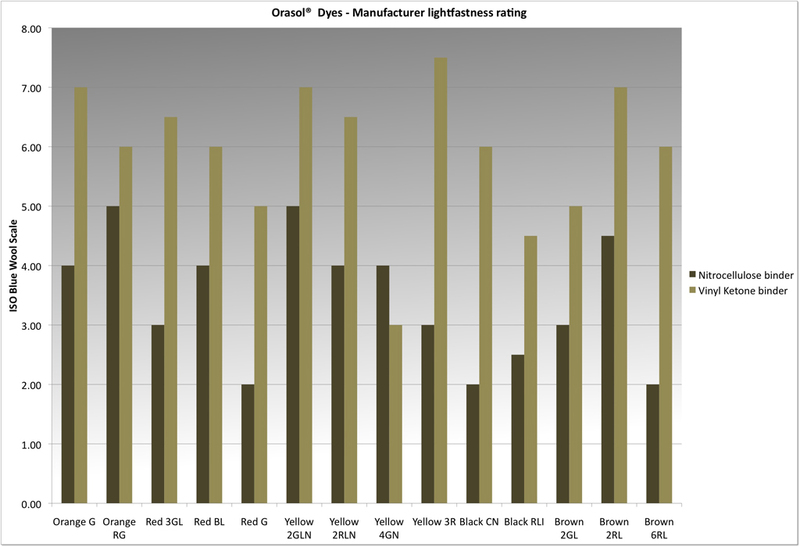 Orasol dye lightfastness ratings according to manufacturer. These ratings are based on their use in printing ink, and the tests were conducted with two different binders (nitrocellulose and vinyl acetate) which produced significantly different results. To be able to judge the lightfastness of the Orasol® dyes when used on taxidermy, it was necessary to conduct our own tests without any binding media. The lightfastness of the dyes was tested using accelerated light-aging following the ASTM D4303 Standard Test Methods for Lightfastness of Colorants Used in Artists’ Coloring Materials. Test swatches were produced by airbrushing a 1% solution of dye dissolved in ethanol onto unbleached 100% wool as well as swatches of bleached bison fur. As a flat substrate of keratin fibers, the wool textile was chosen as a reasonable substrate to measure color changes using a spectrophotometer. Details about the testing procedure will not be listed here, but will be covered in subsequent posts as continued lightfastness testing is part of the current research program. 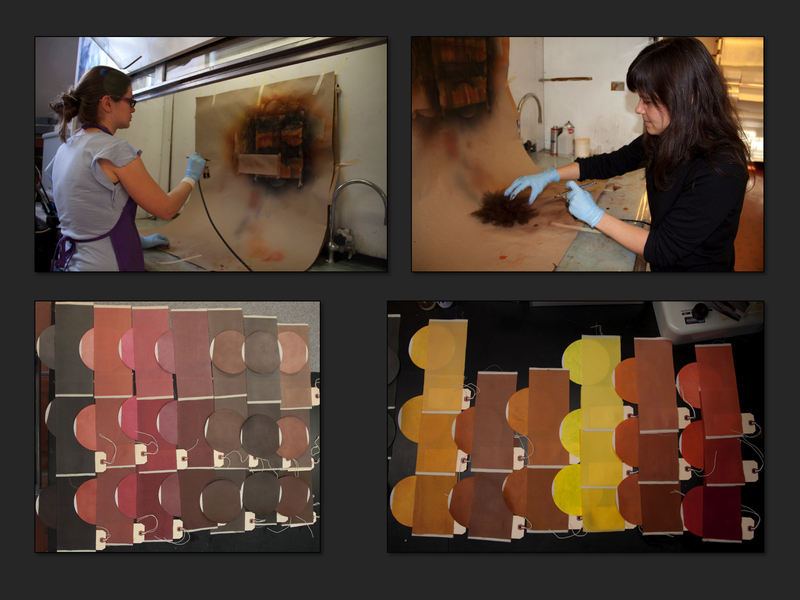 Conservation Fellows Julia Sybalsky and Rebecca Pollak prep swatches of Orasol dye for testing. The ASTM protocol requires exposure of test materials to a broad spectrum of light that includes ultraviolet (UV) radiation. Since new lights in the diorama are filtered to exclude this particularly damaging light, the test helped us develop a worst-case scenario for assessing the lightfastness of the dyes. 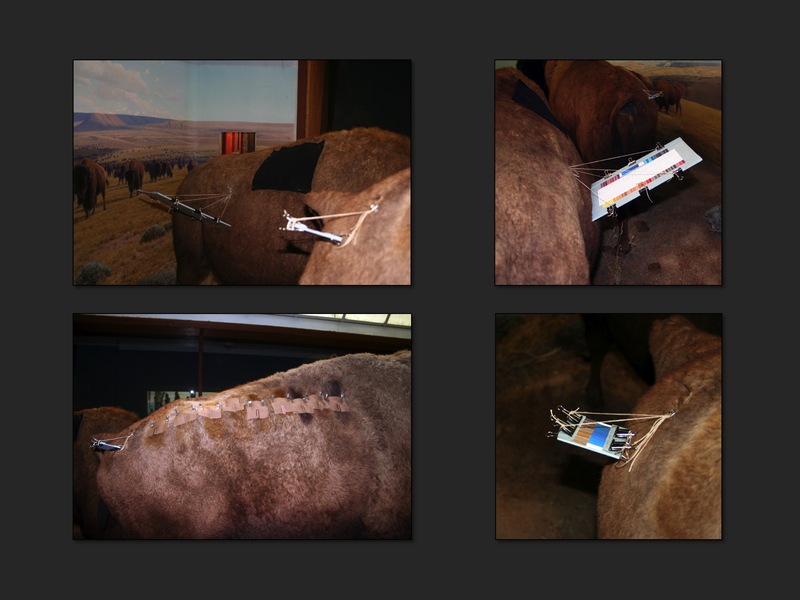 Real-time monitoring of cumulative light exposure is continuing inside the bison diorama. Orasol dyes are exposed in situ alongside Blue Wool reference standards out of sight of visitors. At the same time, portions of the bison have been sprayed with dye mixtures and masked to permit direct comparison of exposed and unexposed areas of restoration. Strategically placed dyed swatches and a blue wool card were placed inside the bison diorama (hidden from view), and sections of the dyed bison were covered for side-by-side comparison. Our lightfastness tests identified the most stable of the dye colors, allowing us to be picky about which shades could be used for the diorama taxidermy. The reversibility and retreatability of the dyes also played a major factor when deciding to use them on specimens in dioramas with higher light levels, with the understanding that fading will occur in time. The AMNH conservation and exhibition team was able to successfully recolor many of the faded specimens in the Bernard Family Hall of North American Mammals. 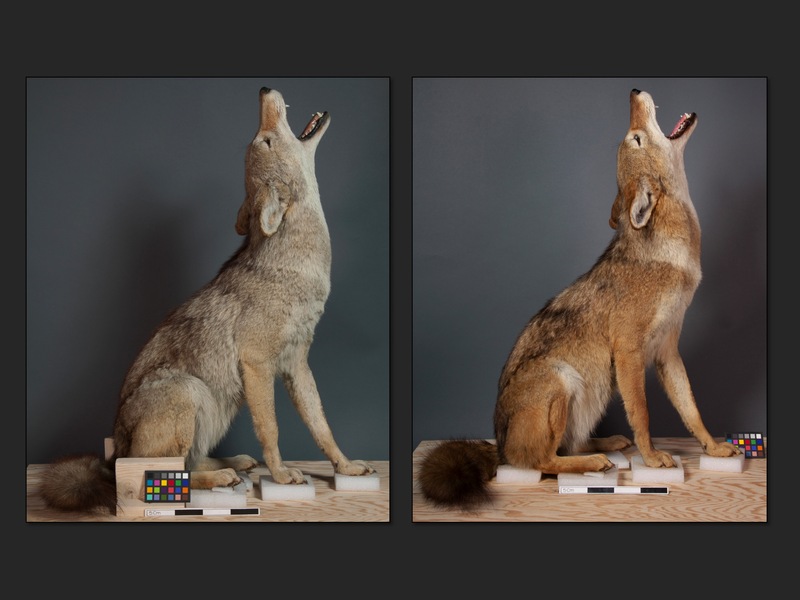 Coyote, before and after recoloring. Lightfastness – While our previous testing did effectively establish a lightfastness ranking among the Orasol colors, it didn’t answer one of the questions we were asked the most often – “Ok, we know that the dyes in the brighter dioramas are eventually going to fade… how long will they last?” By developing a test procedure that mirrors the UV-filtered lighting environment in the dioramas , we will get enough information to be able to create a probable lifespan for these materials when used in treatment. Penetration/Fixation – While the ease of dye removal was beneficial in the 2011-2012 recoloring treatments, in other contexts you might want a greater fixation or penetration of the dye. We want to understand ways we could achieve and manipulate that “fixability”, as well as knowing if those variations impact the dyes working properties and lightfastness. Substrate Degradation – Finally, we want to better understand whether or not the use of recoloring materials like the Orasol dyes causes the colored animal hairs to degrade faster than normal, or do they act as a protectant and slow down light damage? These topics acted as a starting point for the research plan for the current project: Recoloring Faded Taxidermy: Research into the Properties and Applicability of Dye Materials for Conservation Treatment, the details of which will have to wait until the next post!